Sounds like an interesting setup. I don't know why you got the 8080 for a 2-way setup. It's good you have no noise. I also have a 7.1 HT that uses the same front mains. So before I started all of this it was a Khorn/Belle/Khorn up front and 4 Heresies. 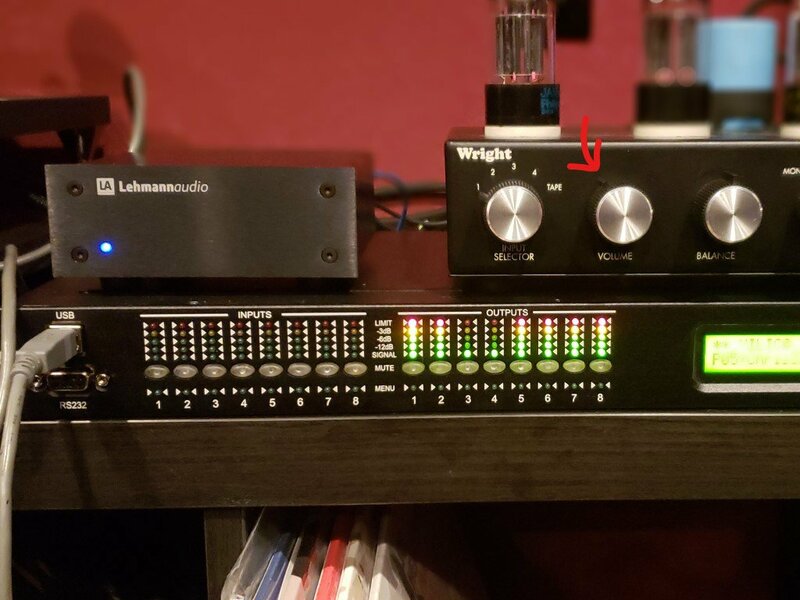 I want to get the 2-channel straight before moving to the HT. Figure I'll crawl/walk before running. You have a digital active crossover now. I don't see why there is any limitation on boosting as opposed to only using cutting in the filters. Of course you can't go crazy and overload the unit. I don't know if you saw my post in my Jube thread but I figured out what the front panel meters are indicating. There are showing level in dB below 0dBFS. And 0dBFS to Xilica is +20dBu. So as long as none of the red LEDs on the front panel meters are illuminating you are not overloading the Xilica. The meters in the XConsole App. are showing levels calibrated in dBu and are therefore much more useful in MHO. I don't know if you saw my post in my Jube thread but I figured out the what the front panel meters are indicating. There are showing level in dB below 0dBFS. And 0dBFS to Xilica is +20dBu. So as long as none of the red LEDs on the front panel meters are illuminating you are not overloading the Xilica. The meters in the XConsole App. are showing levels calibrated in dBu and are therefore much more useful in MHO. Maybe I'm mixing things up that I've read. Is it a true statement that on the EQ side of things (which I'm not messing with yet) when trying to flatten the curve it is better to bring peaks down then dips up? Since I can't just hit Chris up for a Jube export to import on my end, what should my next steps be? If not painfully obvious yet, I pretty much have no idea what I'm doing with an active crossover. Lots to learn and fun so far. Files will have an extension .XDAT. Store them on your computer in a new directory of your choice. I call mine "Xilica Files" Imagine that . Do you have the XConsole App. up and running? And are you connected to the crossover? I am assuming you are. If so you will be able to open the .XDAT file and download to the crossover. Then store it in the crossover so you don't have hook up your computer all the time. Yea I'm clear on all that. No problem storing/recalling files to/from computer or Xilica. With 30 on the unit itself I don't think I'm in danger of filling them up for weeks to come. I'm also clear on the fact I don't have to have the computer hooked up all the time. I'm a software developer so more than familiar on that end. I'm good with IP addresses, USB vs RS-232, hardware, software, etc. I'm really lacking on the Watts/Ohms/Resistance/Transistor/Capacitor/etc. end of things. I also don't know much about waves, octaves, dBs, Hertz, reflections. I'm pretty good at following directions and hooking things up properly once I'm told what to do. I'm asking more of a what next to optimize the sound? With passive XOs you buy the speakers and plug them in. The XO is the XO till you swap them out or change them via a soldering iron. I see a big parallel here between all the Jube guys on this forum and my situation because you have 2-way/active systems for the most part. So do I, just different 2 horns/drivers. Once it is wired up and making noise what next? I'm guessing REW measurements. You can't just blindly start messing with the EQ right? You need to first know what is good and what is bad (whatever good and bad really means I don't know). Next you try to correct the bad I'd think. I was going to buy a used set of Jubes and figure out the whole active thing, but they were sold before I could pull the entire trip together. These Oris speakers came up close to me so I figured I try the active 2-way thing and if some day Jubes come my way all the better. At this point I'm really just wanting to dial them in and decide if I like them enough to get rid of my Khorns or go back to Khorns and scrap my 2-way plus active dreams for the time being. Space is the real limitation. I can't keep both. Is it actually shielding/blocking something like interference? If so why would it need to be soldered up to anything? Sorry I did not see this yesterday or I skimmed right over it. The short answer is YES a properly terminated(connected) shield is at least partially SHIELDING the inner conductor(s) from electrical fields. And yes if it was not connected it would be ineffective. So it is not carrying any signal just blocking outside things....but in order to do that it has to be connected to something at both ends. Are you doing anything to modify your settings on the Xilica or just importing files/settings from known, good, Jubilee exports? If you are making changes what is your methodology beyond trying to make peaks and valleys go away on your speaker readings? Is it a true statement that on the EQ side of things (which I'm not messing with yet) when trying to flatten the curve it is better to bring peaks down then dips up? Yes, especially in the bass region. Most dips there are due to cancellation and boosting those frequencies only eats up amplifier power. As far as modifying settings in the Xilica I am just getting started like you. But I really do not have much time to do this until winter. So far I'm just using settings from ChrisA. So I've briefly chime in here because I am in the same boat and have been doing some research. According to some sources, it may not be advisable to BIND pins one and three together as this may cause damage to the output of the preamp or xilica. Instead, a safer route is to float pin 3 ( dont solder anything to it) and just solder the shield (pin 1) directly to the barrel of the RCA Connector. Again I know for a fact that the Xilica output on pin 3 is just the signal ground through an impedance that matches the impedance of output on pin 2. Thus making it a balanced output. Tying this to ground on the RCA connector end will not damage the Xilica's output. Please give a link to "some sources"
From what I have read from several sources googled, there are some pieces of equipment that can be harmed binding pins 1&3. In the case of my McIntosh preamp I dont think binding would be a good idea. In the case of xilica, it sounds like you have done your research and this is not the case. Being a Jube/xilica newby... I did construct my XLR > RCA floating pin 3. If NO harm will occur, what can i expect if i bind pins 1&3. Are you talking now about the INPUTS to the Xilica? From an unbalanced output(your McIntosh pre)? The McIntosh has all XLR and RCA outputs but if I were to do a xlr-rca binding 1&3 this may damage the output of the Mac if feeding a rca amplifier from the xlr output? Xilica output to rca I out of tube amp. Should I determinate the cables binding those pins? No harm? Yea I don't know the circuits in your Mac. I would not tie pins 1 and 3 together on any XLR OUTPUT that I did not know the circuit topology. Yes no harm. But tie the wires on pins 1 and 3 of the XLR output AT the RCA connector at the input to your amp. Good stuff, ill reterminate and see if i notice a difference..
Now you got me worried. Just happened to be listening to some music and looking at the Xilica and I recalled something you posted about the lights. Didn't give it much thought back then because I was still hooking things up. My meters are frequently maxed and at pretty low volume. Give below and look and let me know what you think. The really strange thing is for now I'm only using outputs 1 to 4. 1/2 are the LF bass bins in my 2-way system and 3/4 are the HF horns. So why are the meters even reacting with 5-8? Anyway, my understanding is, it's the INPUT lights you want to max out (without clipping). By maxing the inputs, you will maximize your signal/noise ratio and give you the best sound. I'm totally scratching my head trying to figure out how you can have blazing output lights but totally dim inputs?? If my outputs were lit like yours, you probably couldn't be in same room. In my case, I've got the Crown K2's on each speaker but, the gains on them are about 25% instead of cranked all the way up. This forces me to use more input voltage (and light up the input panel a bit more but it is STILL generally, "un-lit". So why are the meters even reacting with 5-8? I'm guessing they're mapped to the inputs. If you remapped them to inputs 3,4 then they might go dim.